When he put pencil to paper, sketching out these broadened streets amidst carefully-placed shade trees, the thought was on future framework and infrastructure. These plans- these incredible designs- became the pathway of how the city would grow from a shantytown into a beautiful metropolis. 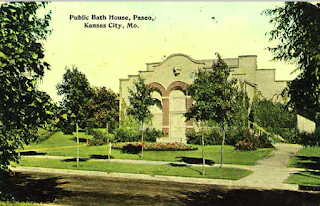 George Kessler was a visionary, and one of his finest creations before the turn of the century was none other than The Paseo. Without much consideration of what The Paseo meant for our rich history, the city council took a swift vote in January that has erased its historic name from street signs. . .
Before I bridge this abhorrent action, let’s take walk down one of Kansas City’s finest boulevards with 126 alluring, incredible years of history. Eduard Karl Georg Kessler, simply known as “George,” was born in Germany in 1862 and immigrated with his parents and little sister to America around 1865. After some time in New Jersey, Missouri and Texas, George’s father passed away. By 1881, George and his family had come back from Germany and were settled in New York City. It only took a few short months to have George accepting a job in Johnson Co., Ks. 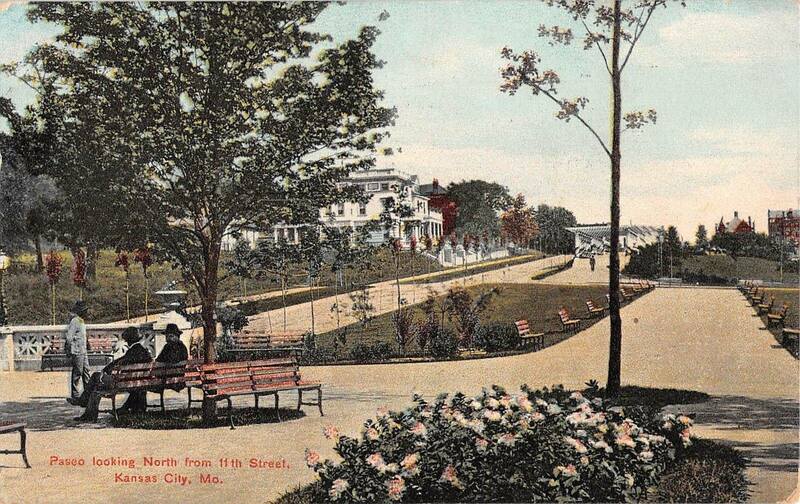 designing a “pleasure park” for the Kansas City, Fort Scott, and Gulf Railway in Merriam, Ks. Merriam Park became Kessler’s first solo run in landscape design, and his design of this 40-acre amusement park drew 20,000 people a day. This had people in Kansas City interested in Kessler’s creations. He was commissioned by the sprouting town to design the landscaping of the now-historic Hyde Park neighborhood. His design showed his ability to use the natural curves of the land and make them purposeful. Heightening this natural design was his gift; he accented nature with benches, pathways and further beauty with flowers and trees. In the meantime, the city to the south was forced to address one of the negative aspects of urban sprawl- the city was dirty. Pavement, sidewalks and any semblance of nature within the city was nonexistent. A chance meeting with William Rockhill Nelson, founder of The Kansas City Star, had Kessler in cahoots with one of the city’s most powerful businessmen. Nelson was a huge advocate for better sidewalks, streets, lighting, buildings and police presence. 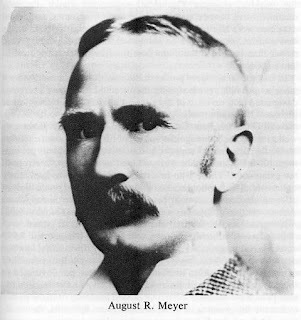 By 1892, Kansas City’s first Park Board president, August Meyer worked with Nelson to hire 30-year-old Kessler as the city’s first landscape architect. 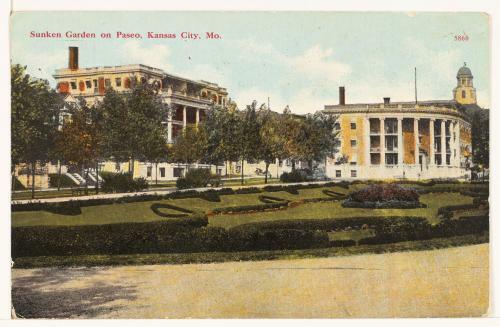 Jeremy Drouin, manager of Missouri Valley Special Collections at the Kansas City Public Library, spoke of Kessler’s impact at the turn of the century. “At a time when Kansas City was looked upon as a dirty cow town- which is mostly accurate- Kessler, August Meyer, William R. Nelson, and others sought to refine the city’s image by developing a park system,” Drouin explained. 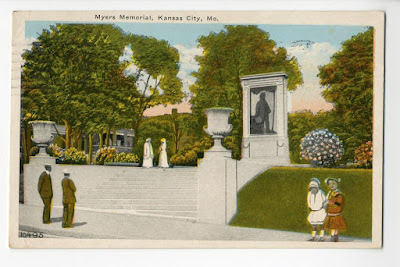 The base of this movement, known today as “City Beautiful,” was the creation of three major parks; North Terrace Park (now aptly named Kessler Park), hosting one of the most stunning views of Kansas City and supporting the historic Northeast area; West Terrace Park, overlooking the West Bottoms and Union Depot, and Penn Valley Park, transforming the slums in the southwest portion of the city. He also penciled in Parade Park, a vacant wooded lot at 15th and Woodland, then known as the circus grounds. The key to his development was in linking all of these parks into one larger system- a system dependent upon easy access to people living within a congested, dirty city lacking green spaces. The solution was in his vision of a complex boulevard system. At the nucleus of this system is none other than Kessler's "premier boulevard," The Paseo. Kessler created Independence, Benton, Linwood, Armour, and The Paseo Boulevards in order to add beauty to a larger system of roads. The oldest of this movement was The Paseo, named after Mexico City’s Paseo de la Reforma, and represented the city’s shift from building roads as straight-up thoroughfares engulfed by structures on all sides to building roads with elegance. Why would he name this iconic boulevard "The Paseo?" Kessler had studied in Europe and modeled much of his work after the famous boulevard systems in the finest European cities. The Paseo de la Reforma was designed in the 1860s, singlehandedly transforming the congestion of Mexico City and bringing beauty to this boulevard. The Paseo de la Reforma was said to have been the first Parisian boulevard in the New World. In 1889, the newspaper reported, "Land worth $200 five years ago is now $600. Along the beautiful Paseo de la Reforma, leading out to the presidential residence, elegant residences are going up." Kessler loved beauty within cityscape; his whole design centered upon bringing nature into the parks and boulevard system. Mexico City's design showed that it was possible to bring this type of beauty to North America. This “crown jewel of the park system” would originally run from Independence Ave. to 18th St. where Parade Park would welcome people from the packed city. 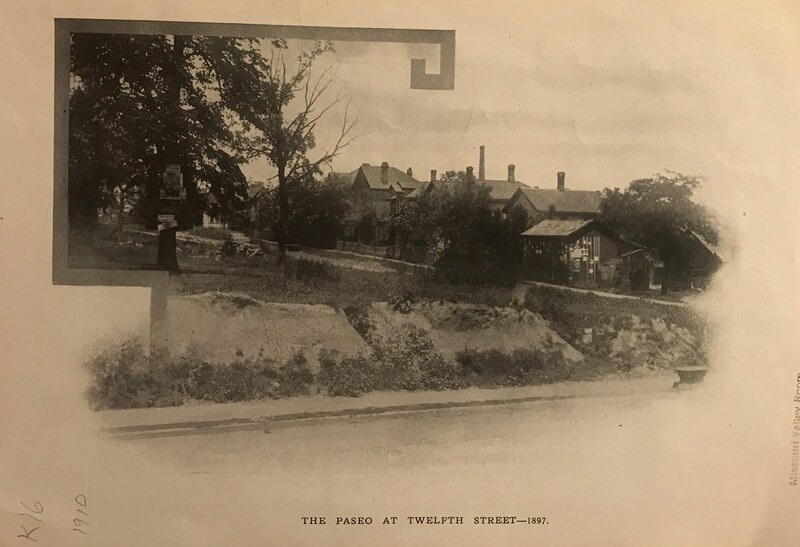 “The Paseo wasn’t just built as a scenic north-south roadway for travel, but as an integral artery and centerpiece of the park system,” Drouin explained. In other words, The Paseo would become the central parkway, giving access to the well-settled residence sections, east of the bustling business of downtown and a quick route to the boulevards and parks. This was the 435 of the late 19th and early 20th century. And it was- and is- beautiful. Transplanting trees along The Paseo, cir. 1900. Jeremy Drouin understands the significance to the City Beautiful movement along The Paseo. “Features such as the Pergola, sunken gardens, fountains, and Troost Lake exemplified City Beautiful and the desire of Kessler to create a parkway for not only navigation but recreation and refuge for the city’s residents,” Drouin commented. 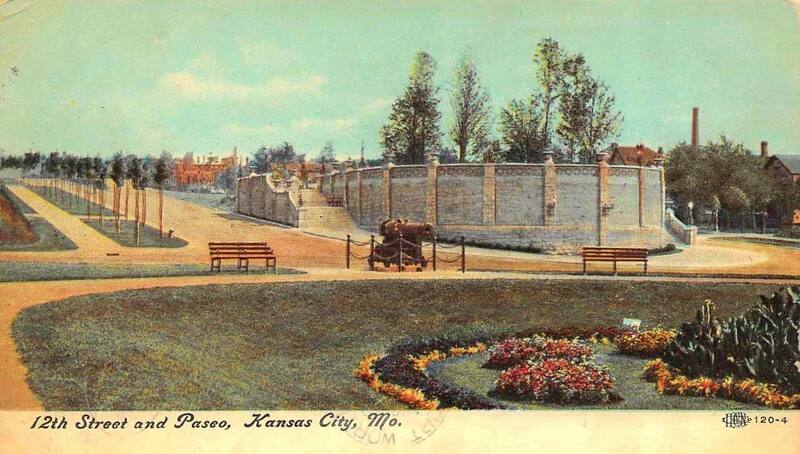 Kessler was so good that Buffalo tried to steal him when they saw his long-term plans for The Paseo. Although he did consulting work for them, he wasn’t about to abandon the heart of his designs. Kessler’s vision to fashion Kansas City “with more boulevards than Paris, more fountains than Rome” would come to fruition through each meticulous sketch. Sidewalks between 9th and 17th St. on The Paseo were completed in 1898, and those city-folk that wished for nature near the city came calling. Some of the finest residences were constructed where once shacks of the east side of the city stood only a few years earlier. At a cost of $11,427.73, the 15th Street Fountain perched on The Paseo and was a marvel to the community. 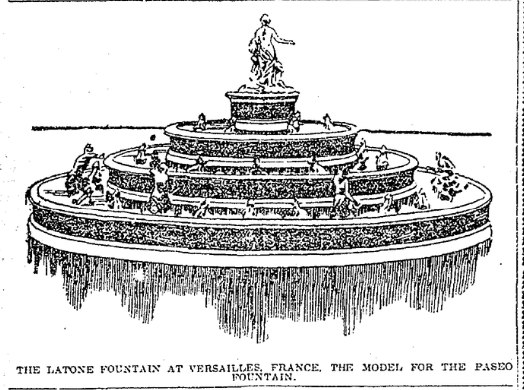 This was the original fountain of the public parks system, predating any Plaza fountain by a quarter century. Unveiled June 21, 1899, the 15th Street Fountain was electric and even had switches to change the colors of the lights inside the structure. The first display chosen was red, white and blue in color. This massive structure spewing water well into the air was beautiful; however, its terraced jets and sprays became a hinderance with the gusty, unpredictable Midwestern winds. It is said that the first level of this towering fountain was removed when a passing parade, including President Roosevelt, was sprayed by its water. One-by-one, the terraced jets and sprays of the fountain were removed. 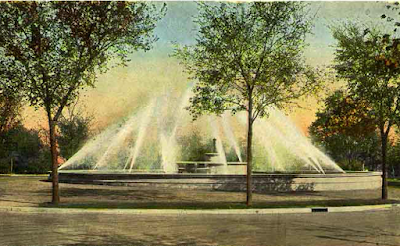 The fountain was permanently dismantled in 1941 when the Parks Board voted to remove it due to structural problems. 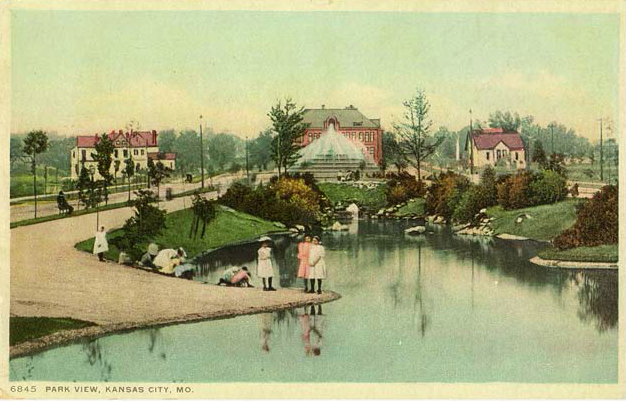 George Kessler was the foundation of Kansas City fountains and the City Beautiful movement. 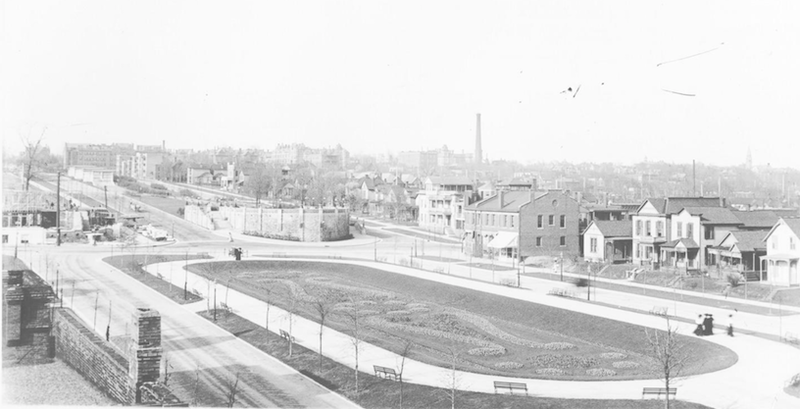 The implementation of Kessler's plan from 9th Street to 18th Street was completed by the turn of the century. In August 1899, the Spanish Cannon, fittingly on The Paseo, was added to the center of the boulevard and the “barrel is engraved with the Royal cipher of Queen Isabel II.” Today, you can still see the Spanish Cannon as part of the beauty of The Paseo. 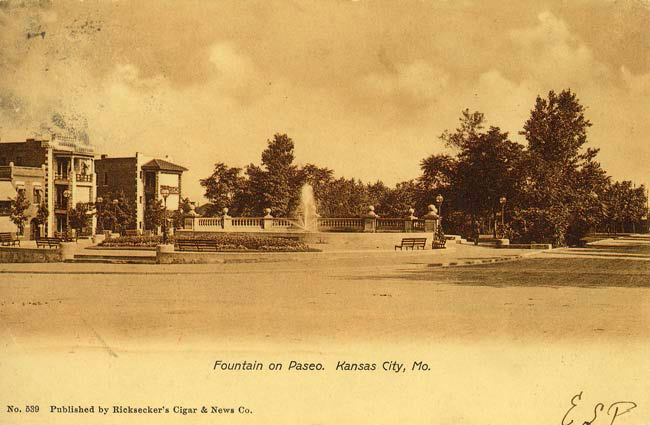 The 9th St. Fountain on The Paseo, now The Woman's Leadership Fountain, was built in 1899 and is Kansas City's oldest surviving fountain. Courtesy Missouri Valley Special Collections. George Kessler’s second fountain was revealed, not surprisingly, at 9th and The Paseo in 1899, further confirming his passion for this stunning street. 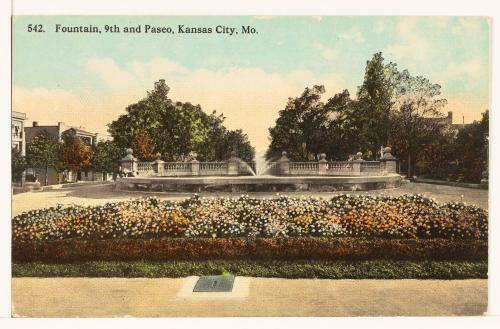 Designed by Kessler and John Van Brunt, the 9th Street Fountain, now Kansas City’s oldest-surviving fountain, has decorated The Paseo for the past 120 years. After being turned off for some time, this historic landmark along Kansas City’s oldest boulevard had water running once again when the Central Exchange raised money for repairs in 1989 and renamed it The Woman’s Leadership Fountain. 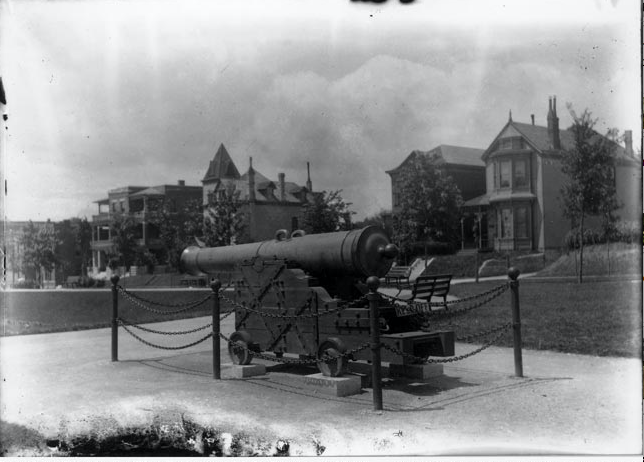 The Spanish Cannon in 1905. Kessler's work is showcased well beyond the Kansas City skyline. His work can be found in 23 of our 50 states. 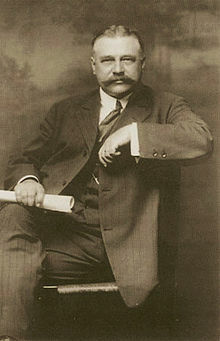 He designed the St. Louis Exposition Grounds for the 1904 World’s Fair. He worked extensively with cities such as Memphis, Dallas, Indianapolis, and Denver. After marrying and having one son, George Kessler left Kansas City for St. Louis. He still worked in the area and even designed Longview Farm in 1912-1913. Indianapolis even has a street named “Kessler Boulevard” after this incredible landscape architect. Kansas City doesn’t have a street named after him. By the time of his death, The Paseo had been extended to the city limits just past Meyer Boulevard, named for his friend and colleague August Meyer. 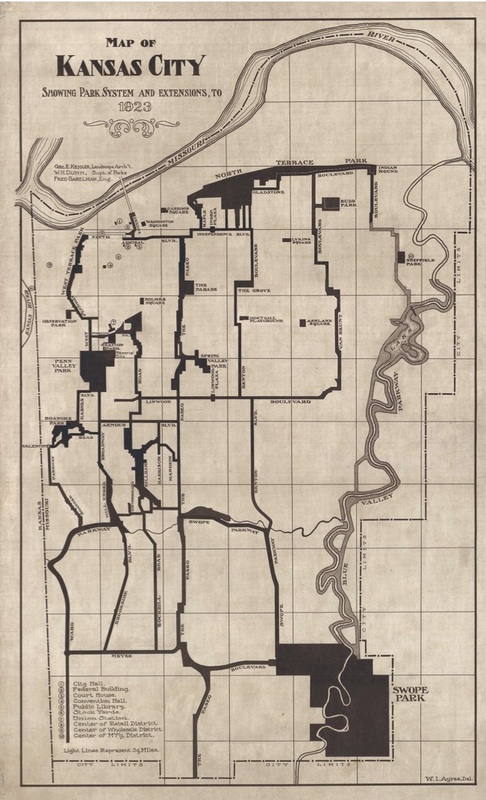 In 1896, bachelor Thomas E. Swope had donated 1,334 acres of land well south of the city. This donation of land assisted The Parks Board and Kessler in continuing the boulevards to the south so that this land could be linked into a larger system. 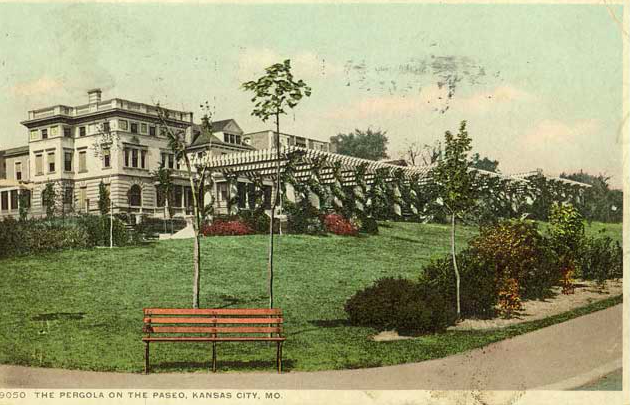 The Paseo has been a significant part of Kansas City’s history. As money was thrown to southern development, the main thoroughfare of The Paseo gradually declined in importance. 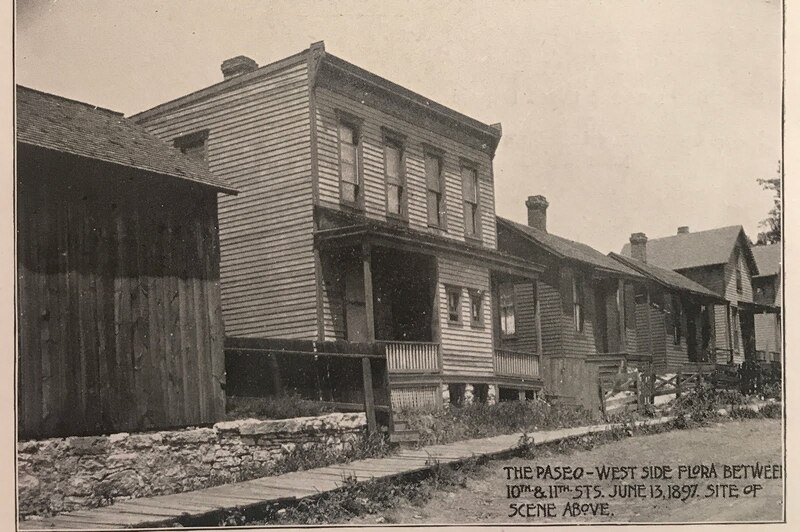 Ward Parkway became the “new” Paseo and by the 1920s, the jazz district at 18th and Vine was bordered on its western side by The Paseo. Further racial tensions due to desegregation of schools in the 1950s created a racial divide on the east side at Troost Ave. So why isn't there a Kessler Boulevard? How do we rename our streets, anyway? 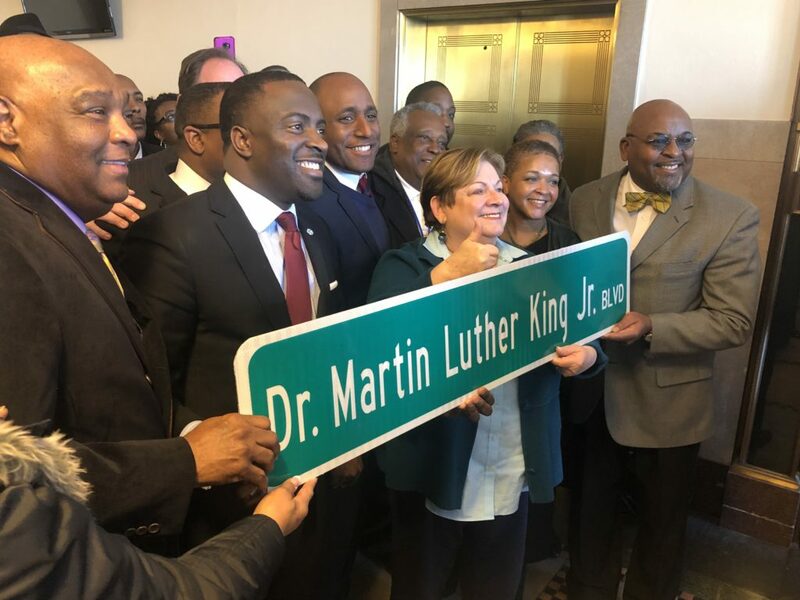 Understanding our history of how streets are renamed is a part of this complicated puzzle that came to a head when the city council decided to ditch The Paseo for Dr. Martin Luther King Blvd. We need to understand the “why” behind this, especially since it has been well-documented that most of the city believed The Paseo was off-limits. Its history is part of the entire community, no matter race, religion or economic status. Streets being renamed north-south is very, very uncommon, as these names have been in place in the heart of Kansas City for, in most instances, over 100 years. Renaming an east-west street has been a part of our history but has never been something done lightly. All of this information is paramount in understanding why so many people are upset with the renaming of The Paseo. Let’s look at 71st Street- now known as Gregory Boulevard. When the city widened the street and wished to give it “boulevard” status, the Parks Board gave the people of the city a chance to submit names for consideration in 1930. 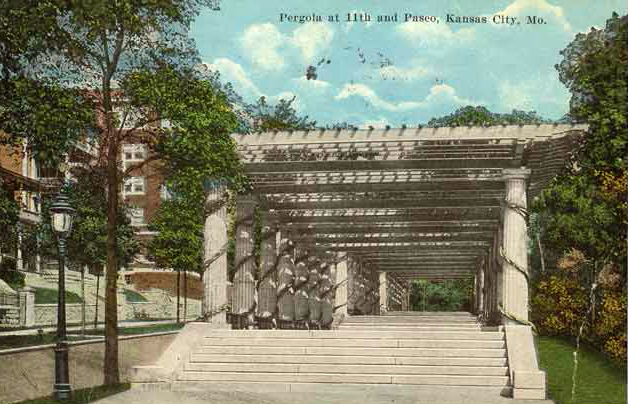 Image reads: The Pergola on The Paseo - It is a covered shade and promenade, supported by columns of enameled brick, and is copied after the pergolas on the shores of the Mediterranean - it is to be between 10th and 11th Streets on The Paseo,which will be finished this summer. 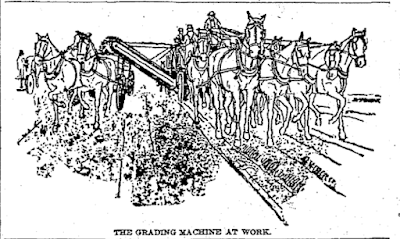 From The Kansas City Star, January 1898. Some of the names suggested included Hoover, Champ Clark, Cammack, D.J. Hugg and Starnel (a combination of Kansas City Star and William R. Nelson). The name chosen, Gregory Blvd., was submitted by the Southside Improvement Association to honor the city’s first mayor, William S. Gregory. The Parks Board voted on it and the name was changed. Good choice, Parks Board. I can't imagine turning onto "Champ Clark Boulevard." 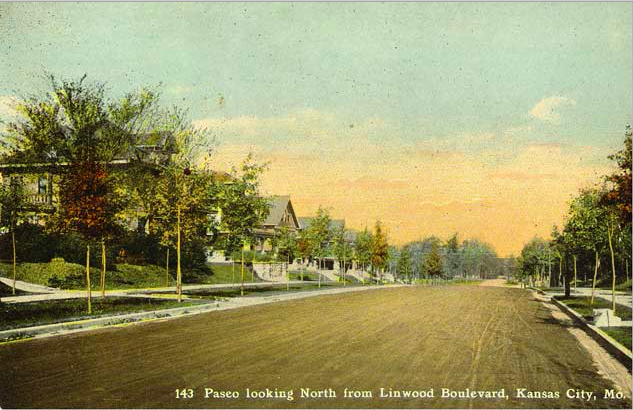 The Paseo, looking north on 11th Street. 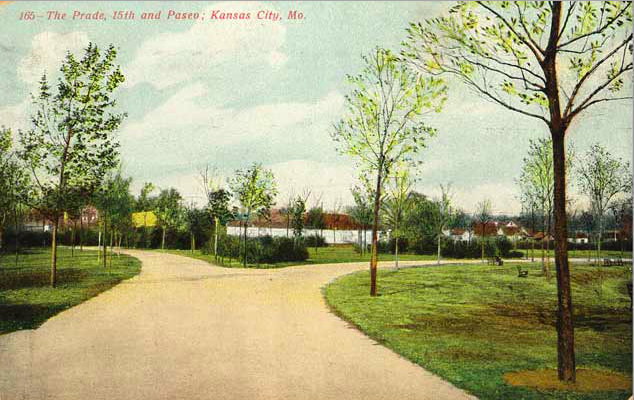 In 1975, the Parks Board was given the right to honor individuals who in the Board’s estimation make “significant and outstanding contributions of land, funds, goods or services to the city and parks and recreation, and boulevards in particular.” The Parks Board, simply stated, is in charge of the boulevard system in Kansas City. It is their decision as to what streets will be named- or renamed. It’s well-documented that Rev. Emanuel Cleaver began preaching from his pulpit at St. James United Methodist Church in the early 1980s for The Paseo to be renamed for MLK. 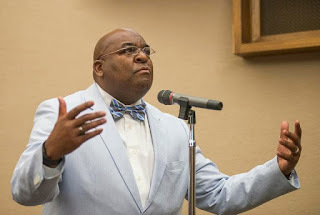 He was the founding member of the Southern Christian Leadership Conference (SCLC) in Kansas City, an African-American civil rights group whose first president was Dr. Martin Luther King, Jr. Yes.. . in order to preserve history. No one stopped this from happening, as it was done legally by the Parks Board. And it's important to note that they kept a segment of the original boulevard's name in order to keep its history intact. But what about The Paseo? In 2014, the city recognized the need to preserve our rich history of the parks and boulevard system that was made possible, in part, by George Kessler. The city hired Cydney Millstein, architectural historian (along with landscape architect P.J. 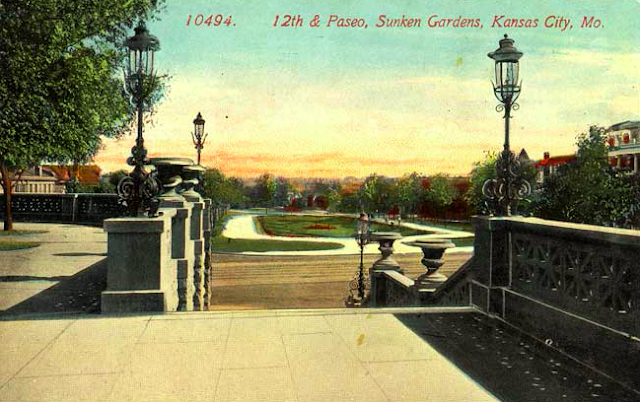 Novick) to research and author the National Register of Historic Places nomination for “Kansas City’s Parks and Boulevards Historic District” which includes The Paseo from Independence Ave. to 18th St. Independence Ave. to 18th St. no longer show this national honor. Millstein highlighted the importance of this boulevard and park system. “These boulevards represent one of the earliest attempts at city planning in Kansas City and were designed not only to link to the parks and to provide pleasurable drives but to also direct the residential growth and property values within the city,” Millstein explained. And when the city started replacing these signs of prestige along The Paseo in February 2019, the brown “Historic District” designation was forgotten completely. Not even a section of The Paseo is being preserved. So, again- how did this happen? How did the community get left out of this decision? The same year a portion of The Paseo was recognized the “Kansas City Parks and Boulevards Historic District”, the SCLC, led by Rev. Dr. Vernon Howard, began to campaign for The Paseo being renamed for MLK. Anyone has the right to make suggestions for street naming and renaming, but the Parks Board should be the final decision. Needless to state, the Parks Board, more than most city offices, knowns all-too-well the historical significance of The Paseo. In April 2018, the Parks Board voted against the renaming of historic Paseo. 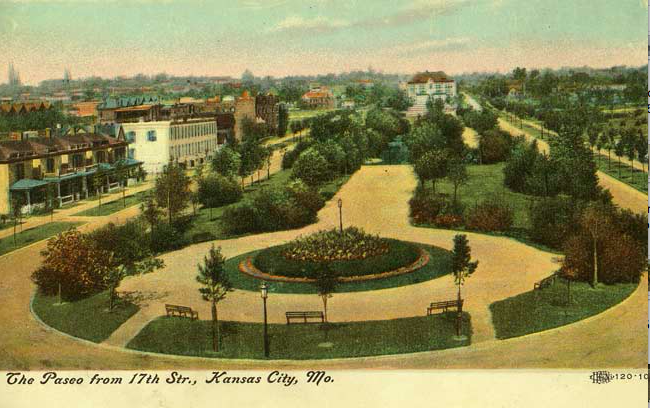 They pointed out that they had dedicated a 42-acre park in Kansas City to King in 1978. They needed these signatures in order to put the renaming to a citywide vote in August 2018. Part of the city charter states, "The petition must be signed by no fewer than 50 residents of the city, and must also include at least 75% of the property owners abutting that section of the street proposed to be honored." In the meantime, the Parks Board asked Mayor Sly James to put together a committee to examine the options available to honor Dr. Martin Luther King, and in April, amidst the petition circulating to put the renaming to a citywide vote, James's MLK Advisory Group got to work. Their petition failed; around 100 signatures were collected by the SCLC from residents along The Paseo- and they never got even close to meeting the required 1709 signatures. But the idea of renaming The Paseo remained as an option for the advisory group established by the mayor. In May 2018, Cydney Millstein, architectural historian who worked on National Register status for the city, spoke to the MLK advisory group and pointed out that a portion of The Paseo (from Independence Blvd. to 18th St.) is included on the National Register. She stated to the advisory group, “Given the historic significance of this boulevard, designed by George Kessler, the eminent landscape architect who planned the monumental and scenic restructuring of the center of the city, it might be better to assign Dr. King’s name to a street indicative of the racial divide- west to east- that still defines our city." Why rename a street with over 126 years of history? Why not choose an east-west street that has history only in the number it falls on? A street running east-west would have a greater impact on the entire city rather than on a 10 mile stretch of one of Kansas City's first boulevards with history. 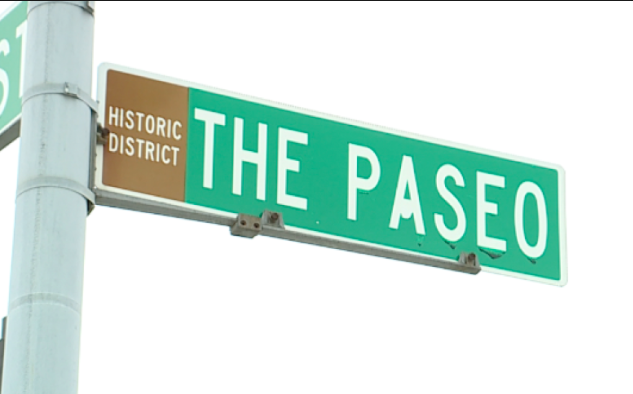 The Paseo may have been one of the options presented by the advisory group, but it was never the forerunner for street renaming. In August 2018, the MLK advisory group made their final recommendations to the city council. The new airport came in first in recommendations; 63rd St. came in second; The Paseo came in third. In a series of public hearings, the advisory group was asked to choose between streets only- and they voted that 63rd St. was the choice with six out of nine votes. And if money is your concern, the mayor’s office stated The Paseo would cost $160,000. 63rd St. would cost $150,000. But the shadiness in the way this street was stripped of its name goes deeper than just ignoring the recommendation of the advisory group or the cost involved in any street renaming. In October, a proposal to “Revitalize the East Side,” introduced by city councilman and mayor-hopeful Scott Taylor, included a provision buried deep in the proposal to rename The Paseo after MLK. The well-supported proposal, "Revitalize the East Side" was approved- after they scratched out the part about renaming The Paseo. At the end of October, the City Council’s planning and zoning committee listened to statements from some members of the MLK advisory board and asked specifically about the renaming of The Paseo. Eric Wesson, member of the advisory board, spoke of the fact that The Paseo was their #3 choice. The planning and zoning committee, including Scott Taylor and Quinton Lucas, voted 4-0 to send the renaming of THE PASEO to the full city council. Think about this- they only talked of The Paseo. Not 63rd Street- not the number one choice of the airport… just The Paseo. That was the only option given, despite grumblings of homeowners along The Paseo and an advisory group's recommendations that took months to determine the city's best option. Possibly looking for a compromise, councilman Quinton Lucas suggested renaming the street "Martin Luther King, Jr. on The Paseo” in December. That plan was short-lived. But Quinton Lucas, now one of two candidates moving forward to the election in November, sponsored this proposal. I don't get political, but this movement for preservation became political. To the surprise of so many with vested interest in this renaming, the city council voted January 24, 2019 on the name change. It passed 8-4. Those running for mayor that voted for the name change included Taylor, Reed, Lucas and Justus. Those against included Alissia Canady and Scott Wagner. 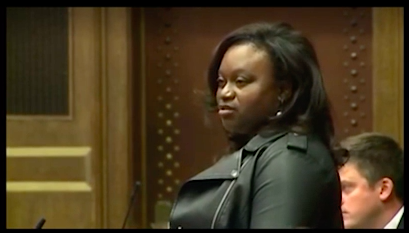 5th District Councilwoman Alissia Canady stood before the city council in opposition to the vote on January 24. She had asked SCLC’s Rev. Dr. Vernon Howard to send the most recent communication about the signatures obtained from the residents along The Paseo. She never received a response. The city council allocated $60,000 toward the renaming of The Paseo, yet the advisory board stated it would cost around $160,000. The pergola pictured along with Dr. Generous Henderson's home at 10th and The Paseo in 1900. Dr. Henderson's home is the oldest home still standing on The Paseo. The Parks Board said no- The Paseo has a history longer than its ten-mile stretch across our city. There weren’t enough signatures collected when the SCLC tried to put it to a citywide vote last year. Photo shows the changes along The Paseo in only a few short years. Sly James’s MLK advisory board never recommended The Paseo. Their first choice was the airport. And as for streets, they recommended 63rd. But somehow… some way… this weaseled its way to the city council. As a historian, I respect our city’s history first and foremost. 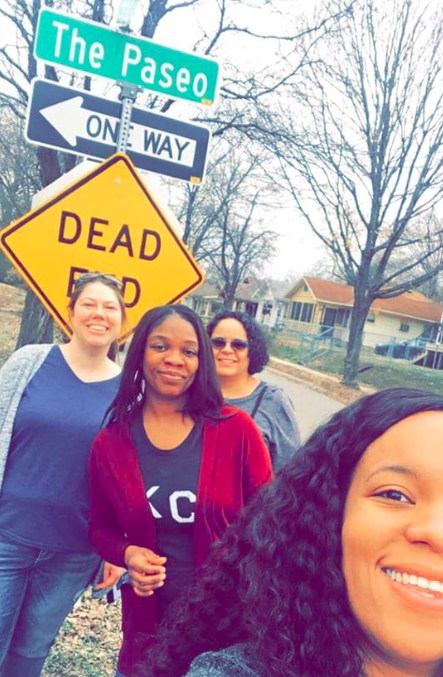 This renaming has flared up in our city- but not because most in the city are arguing that having a street named after MLK- but because they chose one of the most historic boulevards in Kansas City. It’s not just historical to one culture or race. It holds an iconic place upon many, and most don’t want to see it go. February 25, I watched in confusion as the first signs went up to replace The Paseo with MLK Blvd. I couldn’t believe we had gotten here when there was opposition from the beginning. 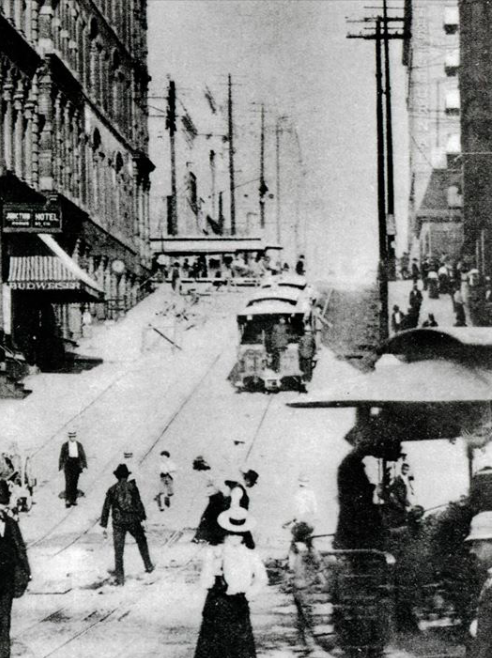 The Paseo at 12th Street in 1897 as improvements were in process. We all have a voice. It’s time to use it. I preach for preservation and acknowledgement that our city needs to educate all about our past so we can have a positive future. When we change a name- a name as recognizable as Ward Parkway, Broadway, Linwood, Armour, Meyer and a host of other iconic names that have been a part of every map, atlas and sketch of our city- we are changing the structure of our past. No one I have talked to has been against renaming a street (usually suggested to be an east-west street because it bridges neighborhoods of all ethnicities) for MLK. But choosing The Paseo just isn’t the street. Tara Green owns the oldest home left standing on The Paseo. When she heard the city council voted to change the boulevard where she lives, she was shocked. “It was almost surreal in that I could not simply wrap my head around how they could possibly pass this through without a vote. And then it happened,” Green said. This has been the message for almost two years, yet the renaming happened despite suggestions from historians, experts and constituents that are directly affected. That’s why I am involved in this effort to save The Paseo. the renaming of The Paseo. Tara Green and Brian Adriano, owners of the Dr. Generous Henderson home (built in 1899) on The Paseo, received a message in their mailbox from a neighbor about the neighborhood coming together to stop the name change. “I could barely get to work fast enough to reply to him saying, Yes! We are in!” Tara recalled. In turn, these brave residents filed a petition to halt the renaming of this historic boulevard; the petition was approved and active on March 15. The end goal, if over 1700 signatures from Kansas City residents registered to vote sign it, is to put this on the ballot. Everyone seems to have a suggestion as to what street or what building should be named after MLK. That's not the main concern at this point; the mission is simply to repeal the name change of The Paseo and ask the city council to put options on the November ballot. I've been out there talking to residents that live on or near The Paseo. Not a single person has stated they were even approached by the SCLC to sign a petition stating they were okay with the name change. In fact, they are just as confused as the rest of us on how this even happened. I've also talked to registered voters with Latin American ancestry; they have expressed concern that the renaming has been "an insult" to their culture as well. Some try to turn this into political gain; others point to racial divides as the reason that so many oppose The Paseo. There is a 42-acre park named for Dr. Martin Luther King, Jr. in this city, yet many are crying for a bigger mark in this city for King. I don't want to see another line of segregation formed in our city. I want to see history preserved, taught and appreciated for what it is. A street named for MLK should be a great addition to our city, but it shouldn't include erasing one of Kansas City's historic boulevards. ** Please search “Save The Paseo” on Facebook and join our fight to save this iconic street. If you live in KCMO and are a registered voter, we need to get your signature! We also have some volunteer opportunities to help save this historic boulevard. * If you enjoyed this piece and would like to follow my writing, go to The New Santa Fe Trailer on Facebook and LIKE my page and see where YOU can meet me and SIGN THE PETITION! Welcome to the New Santa Fe Trailer! Diane Euston attended St. Thomas More grade school, Grandview High School and Notre Dame de Sion. 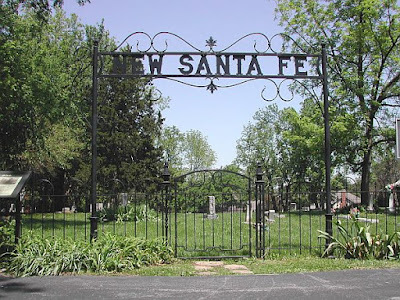 She grew up in the area which was originally part of New Santa Fe, a town in Jackson County, Missouri on the Santa Fe Trail. She graduated from Avila University with a B.A. in Communication in 2004. She entered the wine industry and volunteered at her old grade school as a volleyball coach. After working in sales in the wine and liquor business, Diane knew her heart was in education. She returned to school, first earning her Certification in High School English. She began teaching at an inner city charter school. In 2013, she earned her Masters of Education in Teaching and Learning from Avila University. She is a high school teacher in the Kansas City area, teaches a class called Crossroads of America: Survey of Kansas City, writes a History column in the Martin City Telegraph bi-monthly, serves on the Board of Directors for the BMA Foundation, and devotes much of her outside time to historic preservation. She was honored to receive an "Excellence in Historic Preservation" award in October 2017 from the NSDAR. She can be reached at thefamilygenies@gmail.com or through this blog. Follow the New Santa Fe Trailer by email!